For those who either live in northern Norway or have been watching a webcam, some bizarre dancing blue lights may have appeared in the sky this past week, and it’s not extraterrestrial. NASA was conducting The Auroral Zone Upwelling Rocket Experiment (AZURE), with the first one having being launched and seven more planned, that aims to study the patterns of solar winds. What caused the light show? The rocket released harmless gases into the atmosphere, or trimethylaluminum and a mixture of barium and strontium to be more specific, for researchers to study the paths of particles in the Earth’s ionosphere. Read more for two videos and additional information. Google may become the champion of April Fools’ Day pranks if they keep this up, as they’ve unveiled yet another product that sounds cool, but will never become a reality. This service can be setting Google Assistant on your phone or the Google Home smart speaker to the English language and saying “Talk to Tulip Translator.” In other words, they can now they communicate with humans when they require assistance, such as water, light or some more space. “Socially, it turns out that plants, and particularly tulips, are very chatty, and make for great friends. Tulips are excellent listeners and when listened to carefully, give sound advice,” said Google. Read more to see it in-action. NASA has partnered with two other space agencies that are looking for 24 volunteers to lie in bed for two months straight as part of a study. The compensation? How about $19,000. “We are looking for test persons to take part in a bed rest study from September to December 2019 in Cologne (Germany) and spend 60 days lying down,” according to a statement from the German Aerospace Agency, NASA and the ESA. The goal is to “research how the body changes in weightlessness. Bed rest simulates this condition.” One more caveat: the participants’ beds will be tilted slightly downward to encourage fluids to pool in the upper body. Read more for another video and additional information. Did you see a meteor streaking across the Los Angeles sky a few nights back during the supermoon? Well, it’s not quite what you think, but rather just a clever stunt by Red Bull. Simply put, what you saw were skydivers in wingsuits equipped with LED lights and “Sparking Pyrotechnic”. These daredevils jumped from a helicopter hovering 4000-feet above the Los Angeles skyline and zipped through the sky at nearly 120 miles per hour. Read more to see the video from the wingsuit’s perspective. An Antarctic expedition organized by the Flat Earth International Conference (FEIC) aims to find the frozen barrier they believe marks the edge of our world, which is allegedly thousands of feet thick, stands 164-feet high and surrounds the entire planet. This trip has intrigued many, including YouTube star Logan Paul, who just may join in on the fun. “If you take a globe and you squish it down, the Antarctic would go all the way around the Earth. It’s kind of like an ice shore and it’s very, very large. It’s not like you just go there and you can just peek over it. We don’t believe anything can fall off the edge, because a big portion of the flat earth community believes that we’re in a dome, like a snow globe. So the sun, moon and stars are all inside. It’s very high but all contained inside. So there’s no way to actually fall off of the earth,” said FEIC founder Robbie Davidson to Forbes. Read more to watch Logan Paul’s flat Earth documentary. 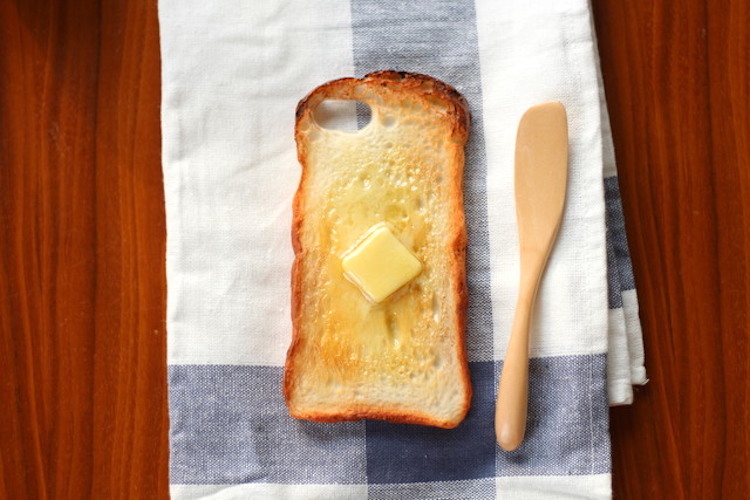 Need an iPhone case and love buttered toast? If so, then “Fairy And You” has just the creation for you. There’s not much information available on this custom creation, but it does look to be made out of some type of flexible silicone material that not only looks tasty, but can at the very least protect your handset from small drops. Read more for a video and additional pictures. Virtual reality headsets are nothing new or special nowadays, but one guy decided to take things to the next level by wearing one for an entire week. Meet Jak Wilmot, co-founder of Disrupt VR, who decided to conduct an experiment, or a 168-hour VR marathon session to be more specific. However, he did allow himself 30 seconds to switch headsets when needed as well as 30 second break sessions to eat, if required. “I have never appreciated the smell of outside air so much. One thing we cannot replicate is nature. We can do it visually and auditorally, but there is something about the energy of outside that is amazing,” said Wilmot. Read more to watch his experience and for additional information. “The Joy of Painting” hosted by Bob Ross is known to be a relaxing television show, but that isn’t the case when you run it through DeepDream, a computer vision program created by Google engineer Alexander Mordvintsev. These painting videos go from instructional to a hallucinogenic dream-like nightmare, thanks to the convolutional neural network used to find and enhance patterns in images via algorithmic pareidolia that deliberately over-processes the imagery. Read more for another example and additional information.